City and County of Honolulu's latest attack on Hawaiʻi's houseless population went into effect today. At about 9 AM this morning, (July 1) the city came and confiscated/stole the property of about 15 of our most vulnerable citizens, our refugee population from the violence of poverty afflicted on them through low wages, high housing costs, failure of mental health services, and more. I interviewed two who were there and four more who had heard about it. About five people remained in the park near the convention center, while others fled to another location. They are continually harassed by police as well as by thieves and other abusive people. One had his pockets cut out of his pants while he was wearing them, taking all his cash as he napped. Many scrape by through recycling bottles and cans, which keeps the city neater and greener. 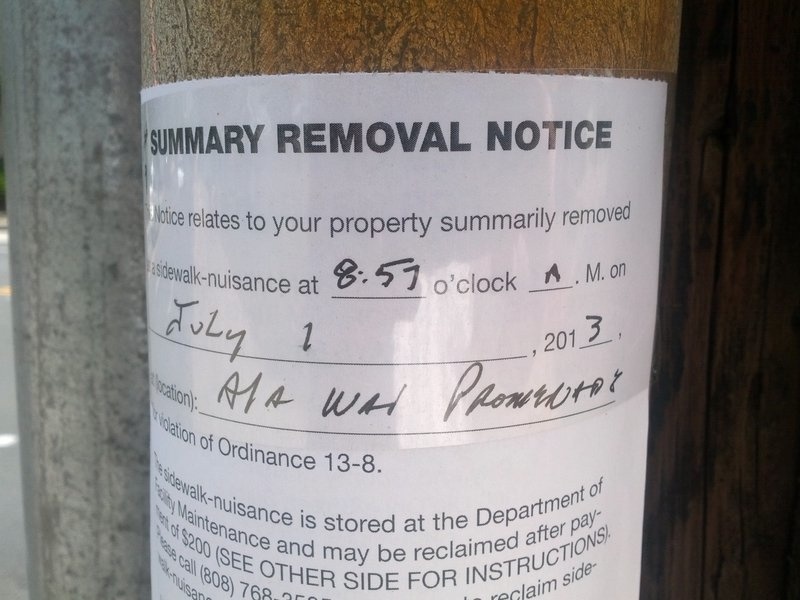 Under the new law, the city declares a site a public nuisance and clears it with no notice. Supposedly the goods taken are stored and can be reclaimed by going to the city and paying $200, which of course most homeless people do not have to spare. Besides the reclamation fee, the houseless must be able to prove ownership of their property. An exception is that any shopping carts will be returned promptly to business owners. The new law means you only have a right to own things if you have a place to stay. It also goes against the state constitution’s law of the splintered paddle, which allows all people in Hawaii to lie by the side of the road without harm. When the law was passed, Mayor Caldwell said he would delay implementation to do outreach to the homeless population and let them know ahead of time so that they would not be caught unawares. I asked all six refugees today if there had been any outreach to the encampment, and all said they had not heard of Bill 7 until I mentioned it, and that the raid came with no prior warning. You can see for yourself from the image at the top of the page that the notice of removal was posted at 8:57, the time of the raid. The camp across from the convention center on Kalakaua was neat, did not block the sidewalk, and offered some protection from the elements to the people staying there by means of tarps tied to the chain link fence. It was no doubt chosen as a target because it sits across from the convention center. Some of the refugees were in the promenade park afterwards and told me that the city threw everything in a garbage truck, basically destroying it instead of putting it in storage, as per their own law. Refugees from the attack said new signage was posted, marking off the sidewalk as a no trespassing zone and forbidding tents and shopping carts in the park at all. New signs forbid tying anything to the chain link fence. It is unclear who posted these signs. One person said that the city warned them not to talk about the raid if they wanted to stay out of trouble. Two others were “loners” specifically because they found that the city tends to pick more on groups of people than individuals. This is an effort to keep the houseless from doing any kind of organizing or assembling without being in danger of raids. In fact, many people were reticent to talk at all at first for this reason. Unlike Bill 54 (the predecessor to Bill 7), Bill 7 requires no advance notice. The city can just come and raid, stealing people's property at will. 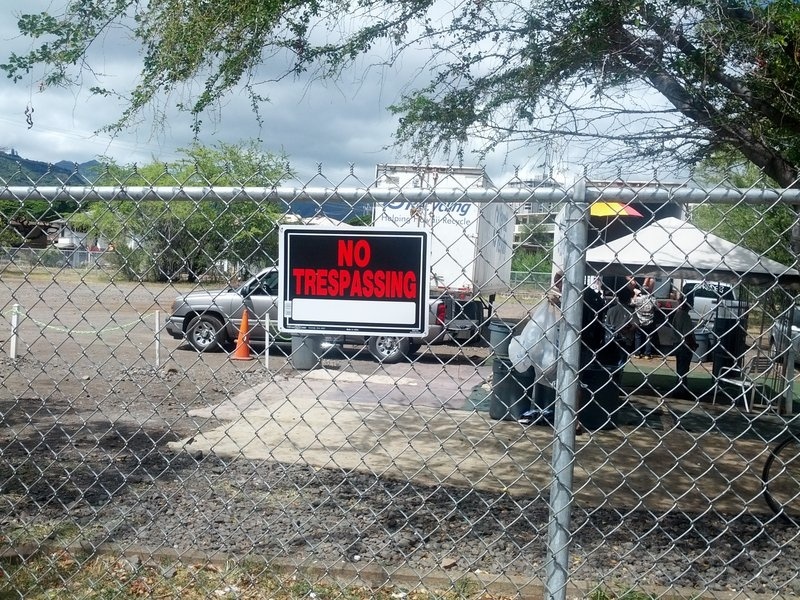 DeOccupy Honolulu won an injunction to stop this behavior, but the city is interpreting it as applying only to DeOccupy, and not to the many other camps that could really use this protection too. We are looking for ways to extend that coverage to all, but the city is trying to keep the houseless in fear and isolated. For more on Bill 7, see ground level media’s five minute primer on the bill and houselessness in Hawaii. See also Laulani Teale’s excellent explanation of Bill 7 and the Law of the Splintered Paddle, Kānāwai Māmalahoe. For ways of Helping DeOccupy Honolulu with the fight against this violence, go to http://www.deoccupyhonolulu.org/. One thing you can do is if you see a raid on the houseless, stop and videotape it if you can, or photograph it, and conctact DeOccupy, as they are collecting this sort of evidence and have a legal team. You have a legal right in Hawaii to videotape, photograph, or audio record police in public spaces in Hawaii. Richard Rath is an Associate Professor of History at the University of Hawaii, Manoa. Rath: "I guess I only had a right to own things when I had a place to stay"